This page features earrings that attach to the ear with LEVERBACK EARWIRE, also known as euro-wire. This style is highly comfortable for pierced ears, one-piece ease of taking it on and off, yet the back pivots closed to create a secure loop when worn. Matte rose-gold plated metal settings (may contain nickel) form earring that is 2-1/4 inches long, 3/8 inch across, with leverback earwire attached at top. A graceful trail of crystals in gold and peach champagne colors include between them a cast metal flower with smaller crystals of the same colors. A briolette crystal finishes the elegant look. 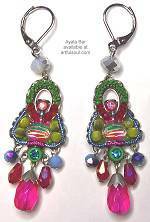 Earrings are 3/4 inch long including the one-piece leverback setting. Large crystal stone is 8mm across, 10mm deep in the setting to make a dramatic statement despite its simplicity. 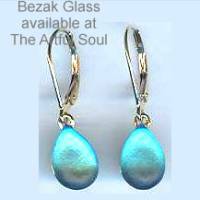 The steel is finished in yellow gold, the crystal is translucent turquoise color. 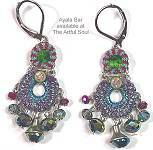 Earrings are 3/4 inch long including the one-piece leverback setting. Large crystal stone is 8mm across, 10mm deep in the setting to make a dramatic statement despite its simplicity. The steel is finished in rose gold, the crystal is opaque jet black color. 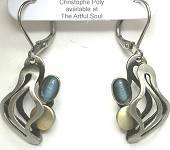 Earrings are 3/4 inch long including the one-piece leverback setting. Large crystal stone is 8mm across, 10mm deep in the setting to make a dramatic statement despite its simplicity. The steel is finished in yellow gold, the crystal is transparent pale celadon green color. 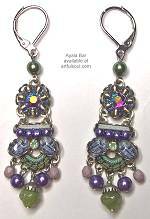 Earrings are 3/4 inch long including the one-piece leverback setting. Large crystal stone is 8mm across, 10mm deep in the setting to make a dramatic statement despite its simplicity. The steel is finished in shiny silver, the crystal is translucent dark misty gray color. Earrings are 3/4 inch long including the one-piece leverback setting. Large crystal stone is 8mm across, 10mm deep in the setting to make a dramatic statement despite its simplicity. The steel is finished in rose gold, the crystal is clear peachy pink coral color. Slender and graceful line of color that is made with mixed shapes, starting with aqua/ivory print at top, crystal and glass beads below. 1-1/4 inches long, 1/4 inch across, on silver plated leverback earwires. Constructed of brass and/or aluminum that is plated. 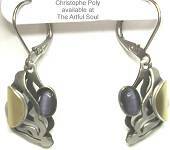 A petite earring of wavy front and back metal cutouts that frame a purple cats-eye cabochon off to one side, folded satin gold circle on the other. 1-1/2 inches long, 5/8 inch across, on silver plated leverback earwires. Constructed of brass and/or aluminum that is plated. Undulating cutout like a flame in nickel finish captures an aqua cats-eye cabochon in the top and satin gold circle underneath.